Once again the MGJ Engineering Brands Hatch Winter Stages was running on my birthday, so what better way to spend your birthday than going rallying! With Suze busy looking after all the media on the event, Lizzie Pope once again agreed to spend the day telling me where to go. The Micra has undergone a lot of development since last year’s event, so it would be interesting to see how much difference that would make. A lot of time and effort had been spent recently repairing the not inconsiderable damage from our last event, Wales Rally GB – man that Welsh gravel can do some damage! The day started off very cold and icy, with a thick frost covering everything. Seeded at Car 42 we were lucky to be starting a bit later than some and with the sun out it was slowly warming up. The first stage was very very slippery, we ran some semi slick Yoko A032Rs (soft) on the front and some Matador wets I had been given by the ‘Mad Kiwi’ Brian Stevens. Luckily we got round with no real issues, although we were very sideways through Druids and getting wheelspin in 4th going down Paddock Hill was interesting on the ice! After the second stage we were lying 3rd in class. Although we were seeded first in class, this was going to be an unlikely end result against the very well driven and developed Nova of the Newton’s. My main target was to beat one of the other Micras (car 70) out on the event which is a similar spec to ours but has a proper ‘box and diff. At this point the Micra was just ahead of us. Going into the third stage, the circuit and stage were drying out, so it was a good time to push on and spurred on by being beaten by the other Micra I upped the ante and by the lunch break we were 16 seconds ahead of the other Micra. During lunch the sun disappeared and was replaced by grey mist and as the day went on it got colder and wetter. Due to a delay (caused by another Micra who was stuck on stage) it was starting to get dark queuing for stage 6 and I wished I had fitted the lamp and corner pods. However, when I ‘nudged’ a cone in the rally school section with the corner of the car I was glad I hadn’t fitted the corner pods as I suspect it wouldn’t have survived…. Going into the last two stages we had a healthy lead over the Micra so it was a case of keeping it tidy and not risking things too much. We fitted the lamp pod and the newly acquired and made corner pods which worked well helping define the edges of the circuit. By now it was getting very slippery and by the time we started the last stage it was really quite wet, and to be honest we should have fitted wets all round, having run the same tyres all day. 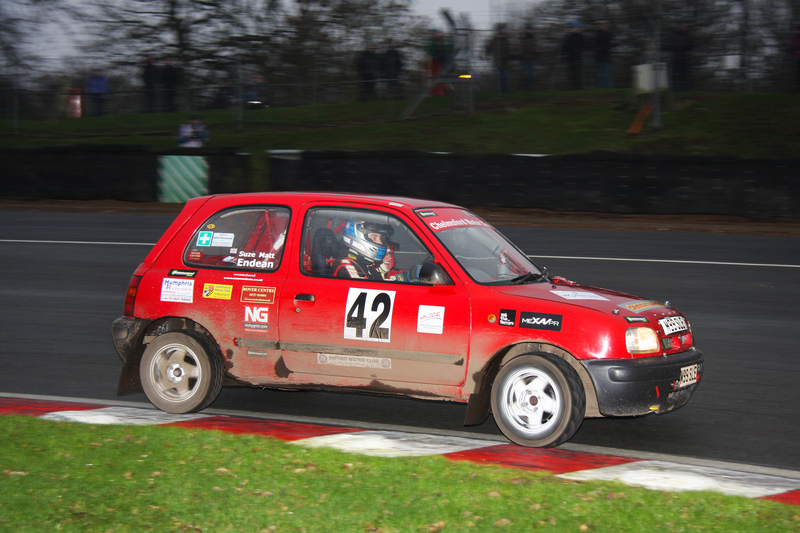 By the end of the event we finished 39th overall and 2nd in class finishing 33 seconds ahead of the other Micra. It was also pleasing to finish ahead of other better specced cars with more power than our road rally spec Micra. Out on stage it was good to mix in with other cars including chasing down and catching (in the corners) a Ferrari and pulling away from a WRC Spec Focus who joined just behind us on one of the merges! Thanks go out to Lizzie for being spot on all day with no missed calls and keeping me under control (well most of the time!). I only hit a few cones…. Thanks also go out to Tom & Jeremy for looking after us and the car all day. A final thanks to all the organisers and marshals for standing out in the cold to allow us to play. So to round up what a great way to celebrate getting another year older, all the development work and new mods since last year have made a real difference, we got a great result meeting my aims, the car was in one (muddy) piece and I got to drive her home after the event.